What does an antipasto platter consist of? As Italian cuisine is highly regional, what people serve as antipasti differs. However, in central Italy, it generally consists of cold meats, cheeses, and grilled or pickled vegetables, with regional variations, of course. 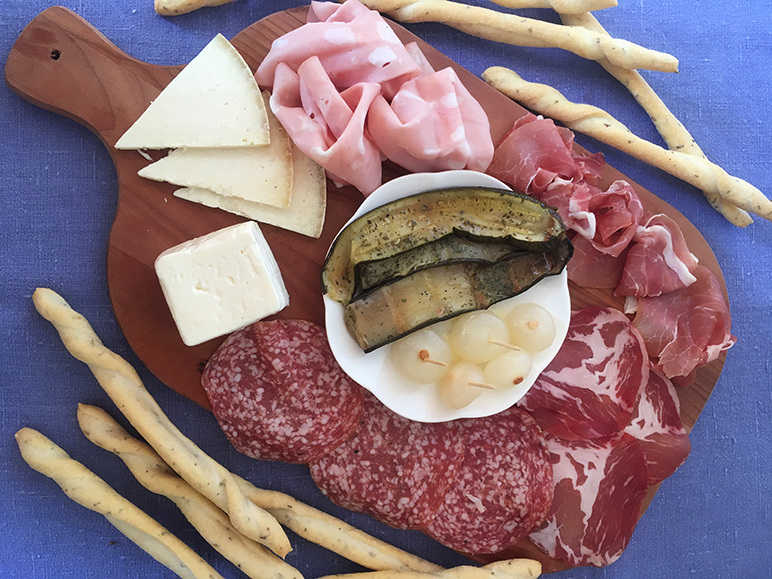 I’m going to take you through how to prepare a typical central-northern Italian antipasto platter, which is the kind of thing you’d find in the regions of Tuscany, Emilia-Romagna, Umbria, and northern Lazio. It will consist of four distinct ingredient sets: salumi (cold meats), formaggi (cheeses), verdura (vegetables), and pane (bread). A typical antipasto platter will contain three to four cold meats of different types. First, a prosciutto crudo (cured ham), then one or two salami, and finally another kind of meat such as mortadella (a bit like baloney or luncheon meat). In Italy, these meats would all come from the same area or region. For example, in Tuscany you might have prosciutto Toscano, with finocchiona (fennel salami), whereas in Emilia-Romagna they’d prefer prosciutto di Parma and coppa. Here’s a handy guide to Italian salumi by region. Prosciutto di parma, coppa, salame milano, and mortadella, clockwise from left. Again, the general rule of thumb is two to three different types of cheese, selected from the same area or region as the cold meats. Most people will choose a hard cheese and a soft cheese for contrast. You can either slice the cheeses yourself or allow your guests to help themselves. Here’s a handy guide to Italian cheese. Pecorino di fossa and squacquerone cheese. The vegetables served as antipasti are generally cold: grilled vegetables preserved in oil and pickled vegetables. The range often includes eggplant, zucchini, mushrooms, sundried tomatoes, onions, artichokes, and carrots. Again, choose two or three different types for variety. Grilled zucchini and sweet and sour onions. The kind of bread served in Italy varies wildly from region to region. In Emilia-Romagna, you are likely to find gnocco fritto (pillows of deep-fried dough), in Tuscany pane sciocco, (unsalted bread), while in Umbria torta al testo (a kind of flatbread) is order of the day. In Lazio you will find pane casareccio served in slices. A Tuscan antipasto platter will also consist of crostini, slices of toasted bread with various toppings. For more about those click here. As an antipasto is a starter, I would serve one slice of each kind of meat per person, a couple of slices of cheese and a couple of slices of bread per head, and then a small amount of vegetables. You could increase the amounts to make it part of a buffet for an aperitivo or party. For my platter, I used the following: prosciutto di Parma, coppa, salame Milano, mortadella, pecorino di fossa, squacquerone, grilled zucchini, cipolla in agrodolce (sweet and sour onions), and breadsticks. Espresso wars: glass or cup? Why can’t you eat chicken with pasta?